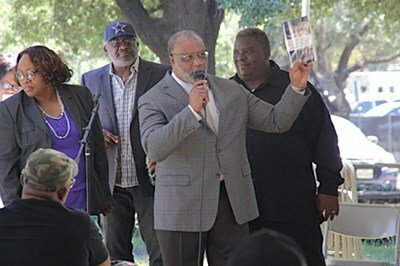 MESQUITE, Texas (BP) – Terry Turner understands the value of knowing African American history by having seen the importance of discovering his own family’s history. Turner experienced this himself at age 10 when his father passed away. The pain and stress of growing up without a father followed him for years. Later, he had a child out of wedlock, continuing a cycle of absentee fatherhood into a new generation. Eventually, Turner came to faith in Christ, got married and had additional children. For his first 25 years of pastoral ministry, Turner counseled couples to live out Christian principles in their marriage, but he struggled to find the satisfaction he felt should have come from his own marriage and family. He began his doctoral work at Dallas Theological Seminary with an emphasis on family and marriage, in part to get answers to the pain in his own family. As he researched the broader history of African Americans for his dissertation, Turner became interested in his lineage, tracing his family back to Warren and Elvira Turner, both born into slavery. Warren had conceived a son with another woman before gaining his freedom in 1865. Even after marrying Elvira, Warren fathered another child out of wedlock. Later generations of men in the Turner family continued this pattern of risk factors including cohabitation and out-of-wedlock births. During slavery, Turner said, nearly nine out of 10 African Americans cohabited because it was their only option. To turn around what he underscores as a crisis in American families, Turner urges all Americans to understand African American history — both the broader history of slavery and racism and the individual stories within families. While slavery impacted African-American families by taking husbands and fathers out of the home, Turner said it also impacted Anglo families by passing on racism and prejudice through later generations. Churches have a role to play in teaching African American history since most won’t learn it elsewhere, he stated. It’s important for churches to teach the Christian principle of love — and be clear about their opposition to hate, he said, adding that love isn’t just something for Caucasians to better understand; African Americans need to get it as well. Because the Bible speaks directly to what ails families, whether African American or otherwise, Turner said his book is full of biblical passages. There is hope for struggling families as churches begin to directly address some of the risk factors that are not only present in African American families but are rising across the board, Turner said, citing such risk factors as out-of-wedlock births, cohabitation and abandonment by fathers.